CAP's Model Rocketry program is an achievement program for cadets interested in the science, technology, and flight of model rockets. The guide builds on the foundation of Aerospace Dimensions, Module 4 Rockets, to introduce cadets to the hobby and science of model rocketry. The guide begins with simple alternative-power models and progressively challenges cadets with more advanced models. Cadets who complete the written and performance requirements for each of the 3 stages, as certified by their unit commander, will be awarded the Cadet Model Rocketry Badge. 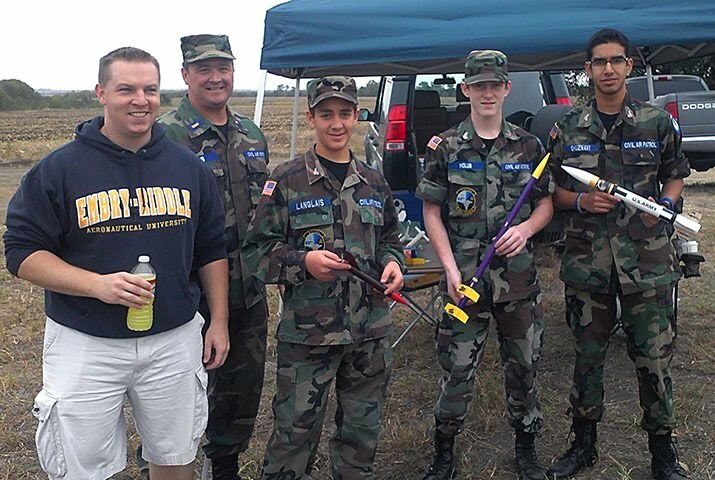 Our most recent launch was aided by members of the Dallas Area Rocket Society, who were more than generous in assisting the cadets with range safety and learning more about the hobby.